Massey Tower is coming. Architectural rhythm and modern style strike a chord on Yonge Street, across from the Eaton Centre. 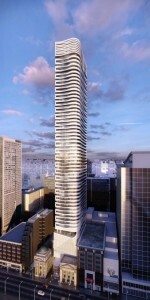 There’s an upcoming one day Broker Sales Event for this exciting project that hits all the high notes. Mod Developments have announced that they have closed on property at 197 and 201 Yonge Street across from the Eaton Centre. The site includes a Darling and Pearson designed Canadian Bank of Commerce branch which opened in 1905 and which has sat abandoned since 1987. ERA Architects will be overseeing the restoration of this building, while other portions of the site at 201 Yonge which currently serves as a parkette and 197 Yonge in behind the bank will see a new mixed-use development with a 60-storey condominium tower designed by Hariri Pontarini Architects marking it on the city’s skyline. Along with interior designers Cecconi Simone and landscape architects Janet Rosenberg + Associates, this is the same team involved in the design of Mod’s current project at St. Joseph Street and Yonge called Five Condos.